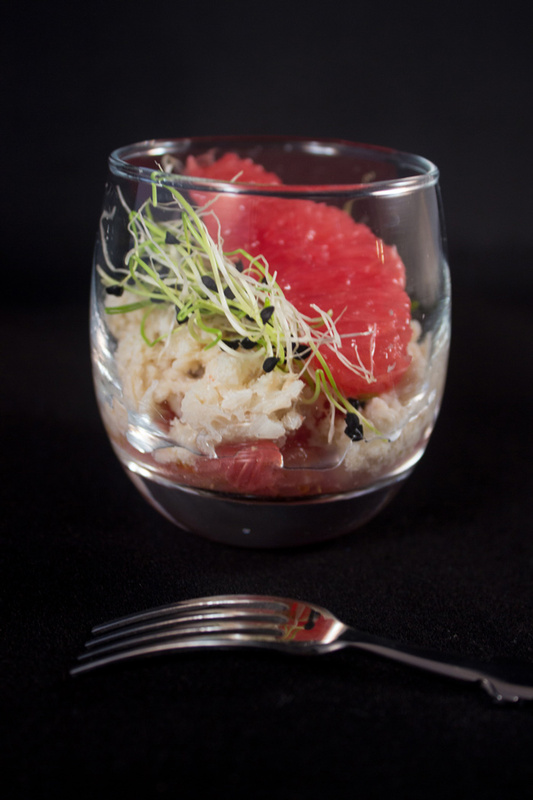 I had some friends over this week-end and wanted to try a new verrine, one with crab meat. Associated with grapefruits, this was really tasty and I like the flashy pink of the grapefruit as well. 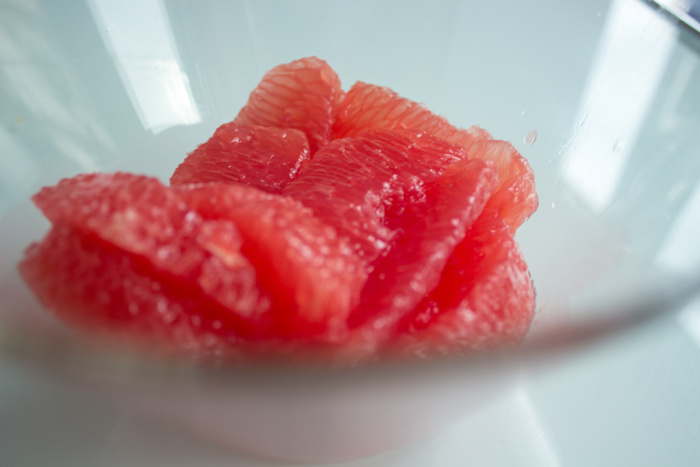 I have also peeled and segmented a grapefruit for the first time. Yes, I am not kidding. I never had the chance before. I was always thinking that it was difficult. But I was wrong this is quick and easy. I would never had thought so. Moreover I bought a mini-studio lately and this is my first picture using it. That’s not my best success, but it is not so bad for a first try. Now I can take pictures by night! Usually my friends are coming over for dinner as a result I am cooking during the afternoon. Now that winter is coming I am always running out of daylight when I want to capture my little verrines. I am convinced that soon this tool will become my best friend. Right now I still need to learn how to use it properly. Are you also using a mini-studio sometimes? 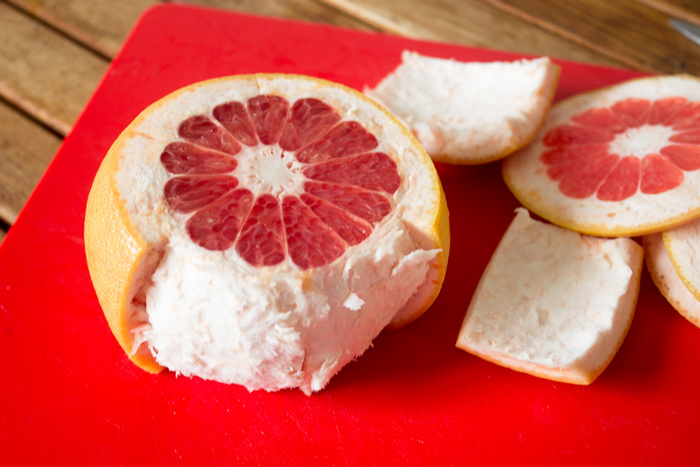 Peel and segment grapefruits. Reserve six segments. Dice the rest adding olive oil, salt and pepper. Add a layer of diced grapefruit, then a layer of crab meat, a layer of onion germs and finish putting one segment of grapefruit. If you liked this recipe, you might want to have a look to the verrine recipes index or check the seafood one. Thank you very much for reading. Register to the newsletter or follow a French girl “cuisine” on social media in order to receive the latest recipes. I’m loving these verrines Natacha! Such a beautiful colour with the grapefruit segments. Thanks Margot. I also quite like the contrast with grapefruit segments! These are beautiful and sound so delicious. I’d never heard of a verrine, so I learned something!!! Thanks. Thank you Mimi. Verrines are very famous in France. All recipes are currently reinterpreted to fit in these little glasses :)!